Designed for The Victoria & Albert Museum, Scarlet Projects, London. We told visitors that extraterrestrials had visited Earth and left behind mysterious objects in the grounds of the Victoria & Albert Museum. 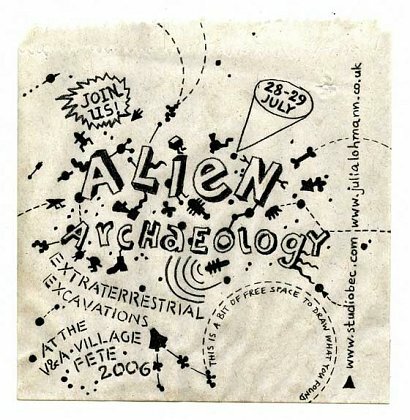 We then enlisted intrepid individuals for our big dig for alien artefacts. Archaeologists big and small could have their finds analysed by our expert panel composed of experienced object unearthers, renegade NASA scientists and young Indiana Jonses. Hours of impromptu storytelling brought to life the purpose of the found artefacts as well as the alien worlds they came from. As a token of our appreciation for their fearless efforts in the advancement of science we then presented participants with the alien artefact they discovered. The alien artefacts were sculptural multiples cast in coloured plaster. They were based on assemblages made from vegetable leftovers and small household items such as drawing pins, wire, electronics and screws.